Toronto, ON – The Ontario Hockey League today announced that Tampa Bay Lightning prospect ANTHONY DEANGELO is the 2014-15 recipient of the Max Kaminsky Trophy awarded annually to the OHL’s Most Outstanding Defenceman of the Year. DeAngelo led all defencemen and finished 13th overall in OHL scoring with 89 points in 55 games played recording 25 goals and 64 assists with 25 multi-point games and a plus-minus rating of plus-34. 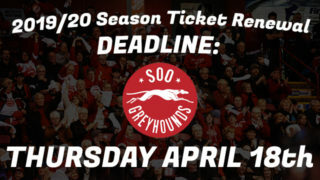 He becomes the fourth member of the Greyhounds to win the award following Ryan Sproul in 2013, Jacob Muzzin in 2010, and Craig Hartsburg in 1977. 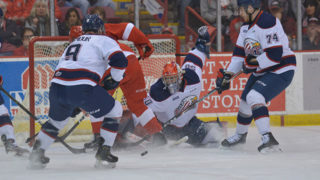 DeAngelo was selected 26th overall by the Sarnia Sting in the 2011 OHL Priority Selection where he set a franchise record for career points by a defenceman surpassing Mark Katic with 190 in 210 games. 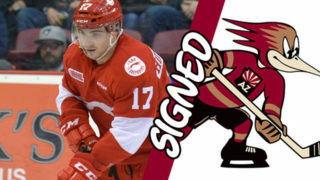 He finished his OHL career with 55 goals and 186 assists for 241 points in 236 games played capped off by a 25-game point-streak in 26 games with the Greyhounds tallying 51 points as a member of the OHL’s West Division and regular season champions. 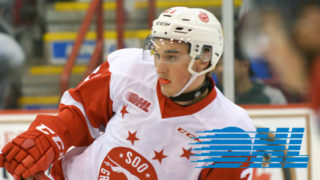 He earned OHL and CHL Player of the Week honours highlighted by a career-high five-point performance on March 1 against the London Knights, and was a back-to-back recipient of the OHL’s Defenceman of the Month Award for February and March. In the OHL’s Western Conference Coaches Poll, DeAngelo was voted third Best Playmaker and Best Offensive Defenceman for the second straight year. The 19-year-old from Philadelphi, PA, is the fifth American-born player to earn the award and first since Plymouth’s James Wisniewski in 2004. 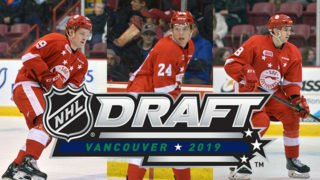 A member of the U.S National Junior Team this season, DeAngelo was selected 19th overall by the Lightning in the 2014 NHL Draft and signed a three-year entry-level contract with the club in December. The Max Kaminsky Trophy is awarded each year to the Most Outstanding Defenceman as selected by OHL General Managers. All 20 clubs submitted a nominee but were not permitted to vote for their own player. 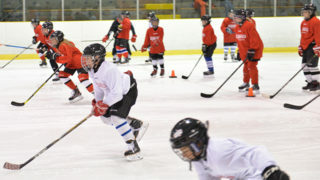 Players received five points for a first place vote, three points for a second place vote and one point for a third place vote. DeAngelo received 69 points in the voting process including 12 first place votes. Colorado Avalanche prospect Chris Bigras finished second in voting with 53 points, followed by Brenden Miller of the North Bay Battalion with 18 voting points. Past winners of the Max Kaminsky Trophy include Al MacInnis (Kitchener 1983), Chris Pronger (Peterborough 1993), Brian Campbell (Ottawa 1999), Marc Staal (Sudbury 2007), Drew Doughty (Guelph 2008), and Dougie Hamilton (Niagara 2012). Just three players have won the award multiple times including Denis Potvin (Ottawa 1972-73), Bryan Berard (Detroit 1995-96), and Ryan Ellis (Windsor 2009 and 2011). Former Barrie Colt and current Florida Panthers rookie and NHL Calder Trophy nominee Aaron Ekblad was last year’s recipient. The award is named in recognition of Max Kaminsky, who enjoyed a 10-year professional playing career that included four years in the NHL with Ottawa, Boston, and Montreal. After he retired from playing, Kaminsky enjoyed a 15-year coaching career that was capped by winning the Memorial Cup with the St. Catherine’s Teepees in 1960. DeAngelo will be formally presented with the Max Kaminsky Trophy at the OHL Awards Ceremony which takes place June 9 at the Hockey Hall of Fame in Toronto. He will also be the OHL’s nominee for CHL Defenceman of the Year award to be presented on May 30 at the 2015 MasterCard Memorial Cup in Quebec City.